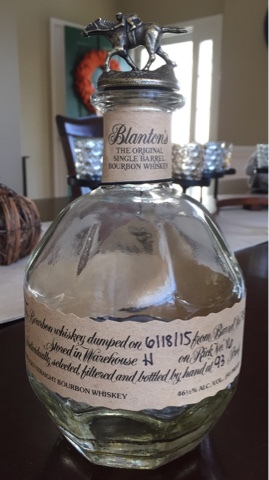 Blanton's is one of those whiskies that has a reputation which precedes itself. Before even opening this one (and even though I received it as a gift), had a moment of worry that I had set myself up for disappointment. I've had a pour here and there of Blanton's in the past and generally enjoyed it. I also know that it is often a favorite among bourbon enthusiasts. Finally, though, I got a bottle all to my self and the opportunity to enjoy it from start to finish, and enjoy it I did! This particular barrel was bottled at 93 proof. The relatively low alcohol content resulted in a very smooth and drinkable bourbon. At first this bourbon came across as dry and woody. However, unlike other bourbons that possess these same characteristics (frequently well-aged bourbons), this one was also very sweet at the same time. It certainly has the traditional bourbon flavors of vanilla and toffee, though the flavors come across as somewhat mild. There is also a light spice and cinnamon flavor up front, something that was actually a bit unexpected. On the back end there was a distinct licorice aftertaste, but yet it still remained very sweet. This is a relatively oily and syrupy bourbon, so the flavor lingered quite a bit at the back of my throat. After this bottle was open for a while it turned into a great bourbon! It transformed quite a bit, turning into a great blend of vanilla and toffee sweetness, much bolder now, with strong anise and cinnamon spices on the back end. Something about it reminded me of Christmas dinner. Take that for what you will, as I couldn't attribute any specific Christmas memory to it. Just a fleeting notion I had while drinking. In addition, from beginning to end, I couldn't help but notice a distinct wild cherry flavor. I've had some bourbons where this flavor was a bit overwhelming, but not the case here. It was subtle enough to be noticeable and enjoyable without dominating the other flavors. At first this was a good bourbon, certainly better than average. By the end, though, this was a great bourbon, one for anybody, whether new to bourbon or a cagey bourbon veteran, to enjoy. Oh, and the bottle, as well as the cork with the little metal race-horse figure, are about as cool as they get!